As our friends in the Northern Hemisphere celebrate the start of spring the rest of us in the Southern Hemisphere, including Australians, are starting to get a hint of Autumn weather. The days are getting darker early, we are no longer experiencing the ‘balmy’ (very hot) days of previous months and we are seeing more wet & rainy days. It’s official, Autumn is here. For those of you who still haven’t yet swapped your summer clothes for the cooler Autumn/Winter (AW) clothes here are some of the trends that may entice you to put your summer gear away. Or if you’re not ready for winter clothes, then just layer it with leather. Leather is that all-round staple item that is handy for any time of the year, whether you need something to throw over your shoulders on a spring-summer’s evening or a jacket to layer with a jumper and a scarf in the autumn-winter days. The AW 2014/15 International fashion shows featured a lot of leather and shearling on the catwalks. From Balmain’s military leather looks, to Burberry shearling coats combined with floral Bohemian dresses, leather skirts in Isabel Marant, and leather shorts and jackets by Antonio Vacarello. I am lucky enough to own a beautiful Burberry shearling coat that I bought back in London (and got a good wear during the London winter months). Whilst we love a good shearling coat, it fortunately (& unfortunately) does not get cold enough in Australia to invest in a shearling jacket (unless you plan a trip to Europe or are off to the mountains skiing ;)). But if you don’t own one yet, a good leather jacket is a great statement piece to invest in this autumn winter. There is a great range of beautiful leather jackets in season from our favourite Australian designers as seen below, from Dion Lee (left), Khalo, Strateas Carlucci (right) & Willow. Not only is a leather jacket a great wardrobe staple it also gives any outfit an edgier yet classic chic look as seen below from Carla Devigne, Emmanuel Alt (worn with black shorts), Rosie-Huntingdon Whiteley (in a biker jacket and jeans) to fashion bloggers wearing a fringed leather jacket with gingham and Look de Pernille (on right) with cullots. Leather jackets have been a staple in my wardrobe for years. I love wearing it with a summer dress (so I can still wear my dresses on the cooler days). 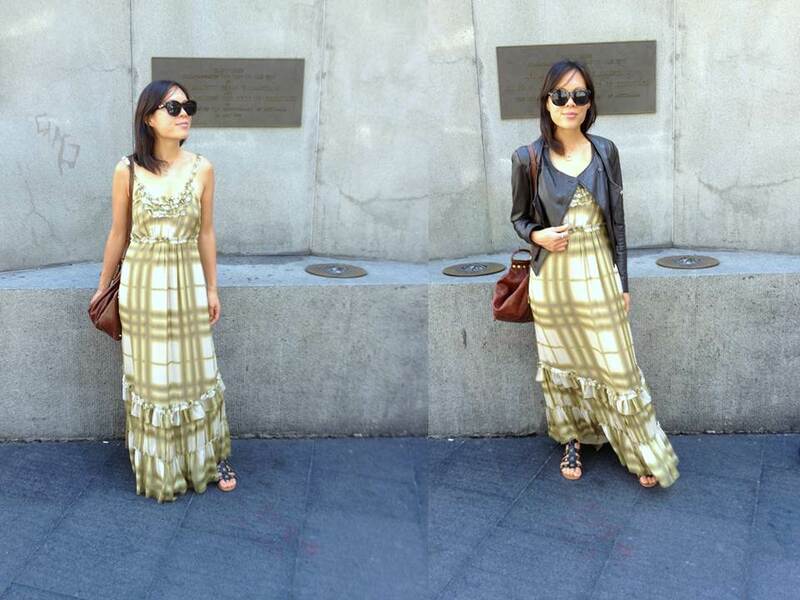 Above: Left – Wearing a Burberry check summer dress and gladiator sandals, Right – wearing a brown leather Co-op (NZ brand) jacket over the dress, with LeSpecs sunglasses and Italian leather saddle bag. 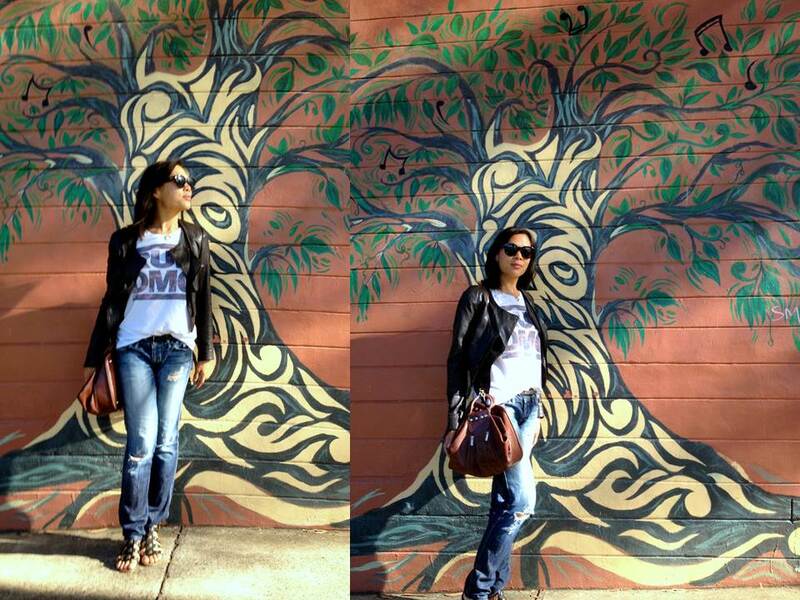 I also love combining the leather jacket with jeans and t-shirt on a casual day. 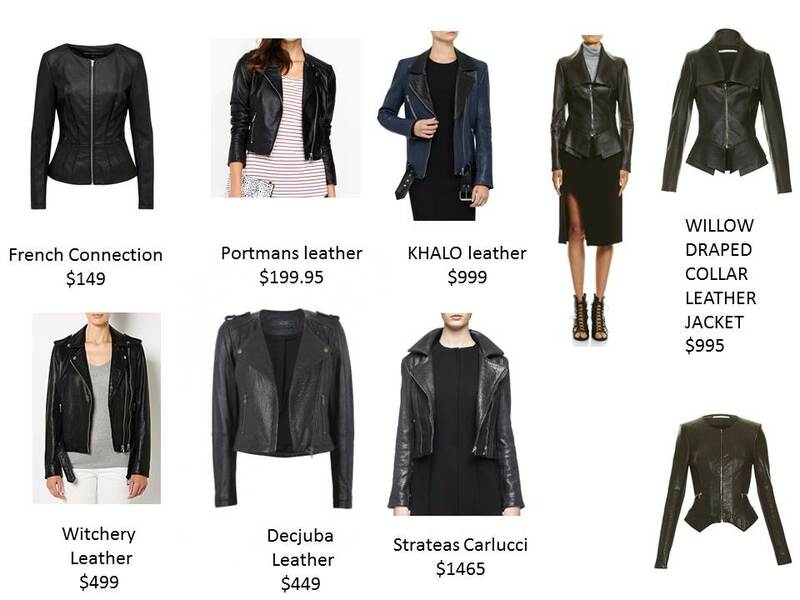 There is a great range of choices for leather jackets out in stores these season, from faux-leather looks from French Connection to investment pieces in soft leather by Willow, Khalo & Strateas Carlucci. 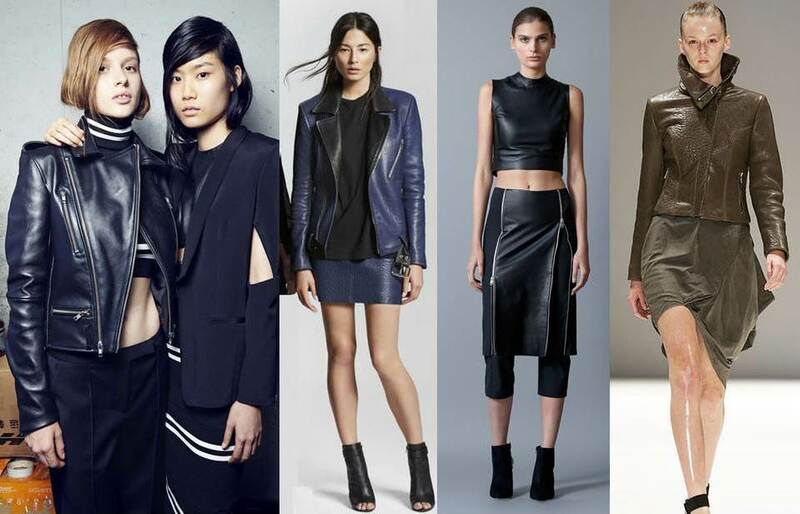 Another great leather look that has returned this season is the leather skirt. The leather skirt has been popular in all shapes and sizes – from A-line, to pencil to short mini skirts, as worn below by the ever so stylish Vogue Australia Editor Christine Centenera in an A-line leather skirt, Alexa Chung in a pencil skirt and a leather mini-skirt worn by my favourite London fashion blogger Lorna Luxe. 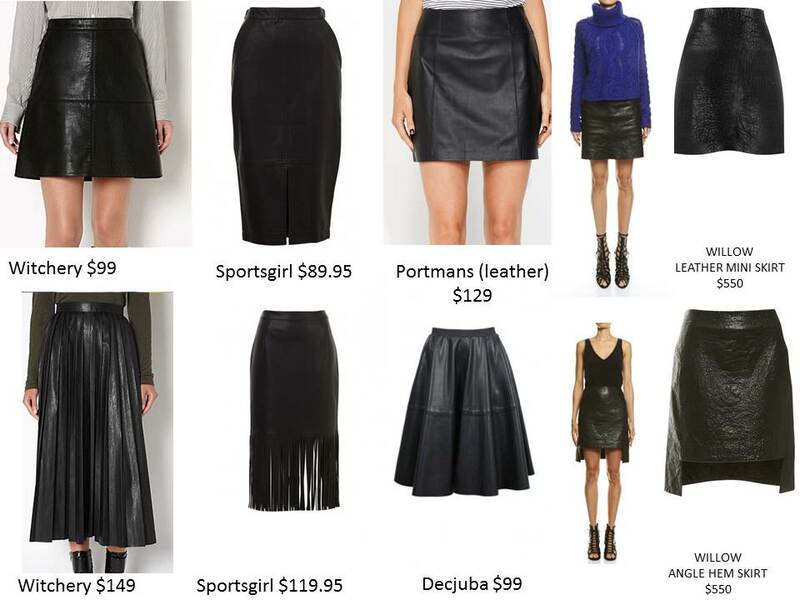 I styled a few clients recently who fell in love with the pleated faux-leather skirt below by Witchery, there is also a great range of mini and a-line skirts available (both in faux and real leather), and of course, Willow has a stunning range. And last but not least, the leather pants have been a favourite in many of our style icons’ wardrobes for the last few years and it is still very much a favourite this season as worn by Olivia Palermo, Nicole Richie, Anna Selezneva. 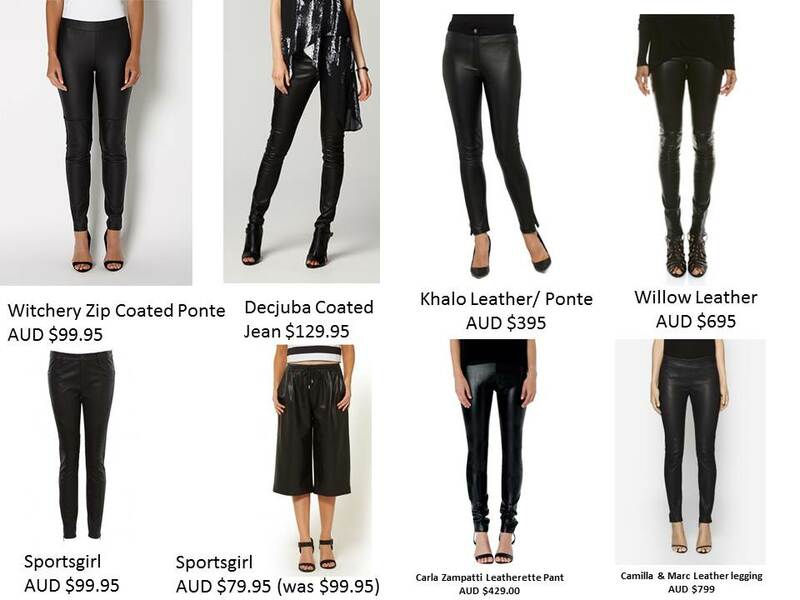 There is a great range of affordable leather look pants in our favourite stores and gorgeous leather pieces at our Australian designer labels from Khalo, Carla Zampatti, Camilla & Marc and Willow. So as you see there are some great leather pieces to add to your wardrobe this autumn-winter that you’ll be wearing all season and some you can still wear other times of the year. I have my eye on a few pieces, what about you, what’s on your wishlist? Follow J’adorais for more style inspirations.